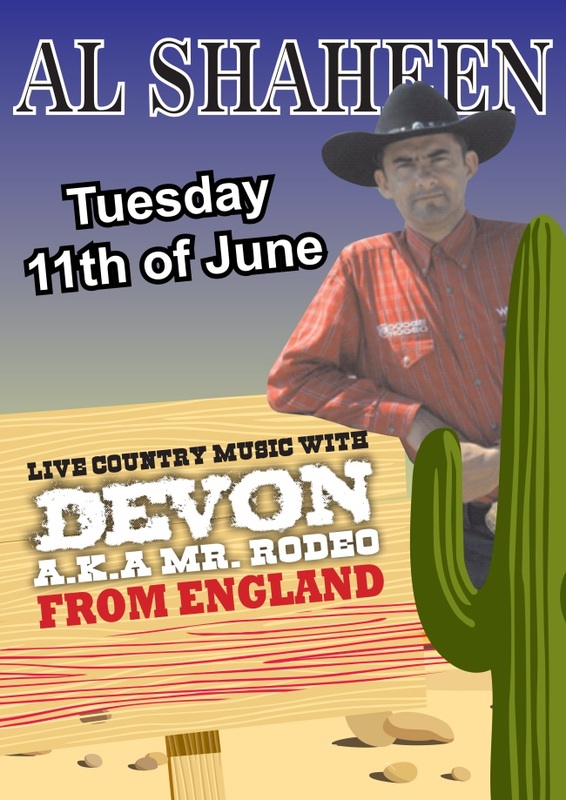 Time is running out if you want to go and see Devon (aka Mr Rodeo) perform at Al Shaheen in Karakum. He will be there on Tuesday 11th June and we will be in for a brilliant night’s entertainment. As well as Devon, there will be some of the Phoenix Line Dance Club there and I am sure they will not need too much persuasion to take to the floor and show us all how it is done. Devon is from England where he performs his country music regularly around many areas of the UK, but he comes to North Cyprus from time to time and is always pleased to treat people to his wonderful style of country music. Why not book a table, have a lovely Al Shaheen meal and enjoy being entertained, country style. After dining there will be plenty of time for dancing as well, line dancing, rock and roll and others will all be possible with Devon’s wide range of music. This entry was posted in Our Friends, Special Events and tagged Al Shaheen Karakum, Devon, Entertainment, Mr Rodeo, North Cyprus, Phoenix Line Dancers by alshaheen03. Bookmark the permalink.